TriFAHL is back for this Spring 2019. This beginner friendly short-distance triathlon will begin and end at the Truman State University Natatorium (near the corner of Franklin and Patterson). There will be a 150 yard pool swim, followed by an approximate 9 mile bike and a 2 mile run. 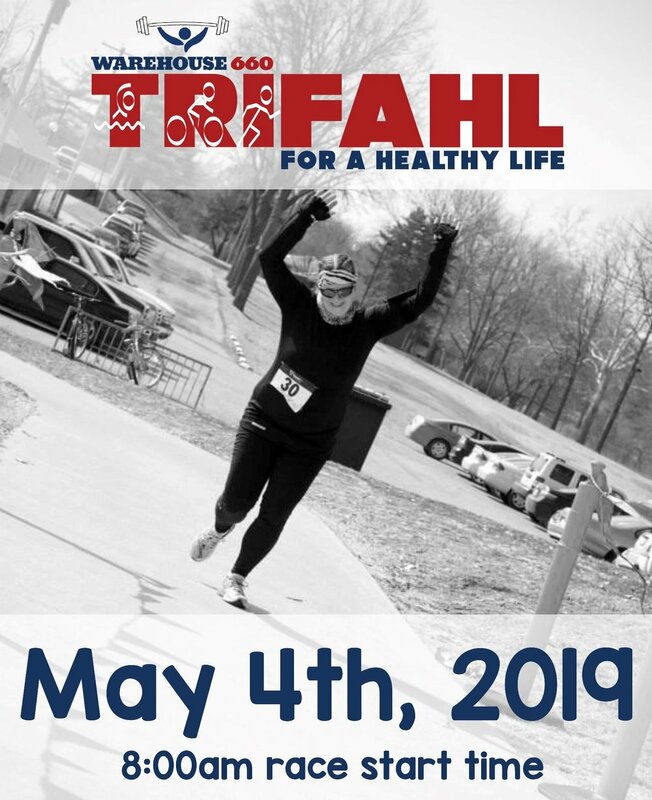 Packet pick-up will be Friday, May 3rd from 5pm to 7pm at Warehouse 660 or Saturday, May 4th from 7am to 7:30am on site. Awards to follow event. Kids Yoga - SuperHero Day! Kids come enjoy yoga AND dress up as your favorite superhero! Recommended for ages 3-13. How far can you row in 5 minutes? Winner will get a FREE membership! Learn the foundations of nutrition, label reading, and more! FREE Event! Make his/her her heart race in our fun partner workout! Our group instructors will put you and your partner through a high intensity work out. You don't want to miss it! Bring your partner in for a fun interactive class and learn professional massage techniques taught by our Massage Therapist, Echo! Learn the basics from our Beginner Yoga instructors, Julie and Tarasa! This will be a two weekend course. Introduce your child(ren) to yoga by spending quality time with them as well! Have your little one enjoy the benefits of yoga through music and story telling! Family yoga is ideal for EVERYONE. Anyone ages 4+ is welcome to learn the FUNdamentals of yoga through a child’s perspective. Reep in the benefits of yoga and give your child(ren) a foundation for a healthy well being through yoga! Family Yoga class is $10. Our beginner series was created for the true beginner. In this introductory class, Tarasa guides new students through fundamental postures and addresses proper alignment. Expect expert instruction and clear direction (Tarasa has saved the yogi terminology for another day!) in this accessible, slow flow class. Yoga mats and props will be provided! No experience necessary. Come join us to compete in our Bench Press & Deadlift competition here at Warehouse 660! Winner will be one male and one female with the highest bench and deadlift total. Men and Women encouraged to join! Come show us how hard you have been working in the gym and move some iron! Winner is the one with the most distance rowed in 5 minutes. What is the 6 Week Challenge? Jump start your health and fitness goals with a 6 Week Transformation Challenge! Would you like to lose 10 lbs in only 6 weeks? Join us in the next 6-week Transformation Challenge and if you show up at least 3x a week and follow our nutritional guidelines you WILL LOSE POUNDS and INCHES in only 6 weeks! PLUS the winner gets $50! How you say? You show up. You join a group that is MOTIVATED to lose weight, change habits and support each other. You stop eating loads of crap. Yes, STOP. If you’re ready to lose pounds and inches and have a support team that you can count on, then you should join us on the next 6 Week Transformation Challenge! Q: When are the classes?A: We have morning, mid day and evening classes. Q: What fitness levels is this for?A: All! That’s the awesomeness of this challenge! We can give modifications or progressions depending on your fitness level. Q: What do I need to bring?A: Bring a water bottle and a can do attitude! Q: Do we meet before the challenge starts?A: Yes! We will meet the Sunday November 5 at 7:00pm to take measurements, before photos, before strength test, get handouts and meet everyone! Q: Can I invite a friend?A: Yes! Accountability is key to sticking to it! A friend will make sure you show up and push you to work harder! Plus, everything is more fun when you have a friend along side you! What’s Included in the 6 Week Transformation Challenge? This class will take you through fundamental techniques for basic self defense.